The Okeson trail is located in the Uncompahgre National Forest and Wilderness Area near Ouray, Colorado. 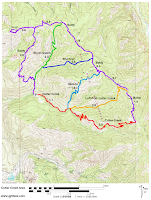 The trail begins around the 9,000 foot elevation level at the 1 mile point of the Cutler Creek trail and climbs to its upper end at the Baldy Ridge trail where the elevation is over 10,000 feet. The Okeson trail is one of a half dozen trails that climb the various drainages in the Culter Creek area to reach Baldy Ridge. 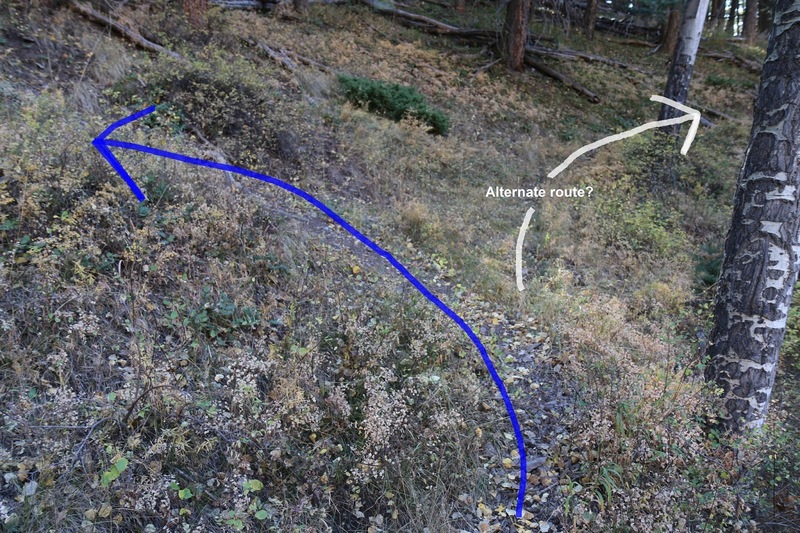 By combining the different trails to form loops hikers can design routes of various lengths that are suitable for both day hikes and backpacking. For this post we hiked up the Okeson trail and crossed a section of Baldy Ridge to get to the Shortcut trail that we then hiked down to Storm Gulch and back to the Cutler Creek trailhead. To get to the trailhead drive north on Highway 550 from the Ouray Hot Springs Pool for 1.6 miles and turn right on County Road 14, the Dexter Creek Road. Bear to the left near the 1 mile point onto County Road 14A. As you follow CR 14A it will cross into the Uncompahgre National Forest near the 0.8 mile point where the road forks. Stay to the right at this point and continue as the road climbs for awhile before descending into the Cutler Creek drainage. Bear left again around the 2.5 mile point from Highway 550 where another pretty good looking route angles up the hill on the right. Continue for another half mile or so to Thistle Park where you will find the sign for the Cutler Creek trailhead. Parking and a few primitive campsites are available in the area near the trailhead. A 4-wheel drive is recommended to make it this far but when the road is dry and in good shape a good driver in a 2-wheel drive with a little extra clearance can do fine. From the parking area follow the Cutler Creek trail as it heads east. 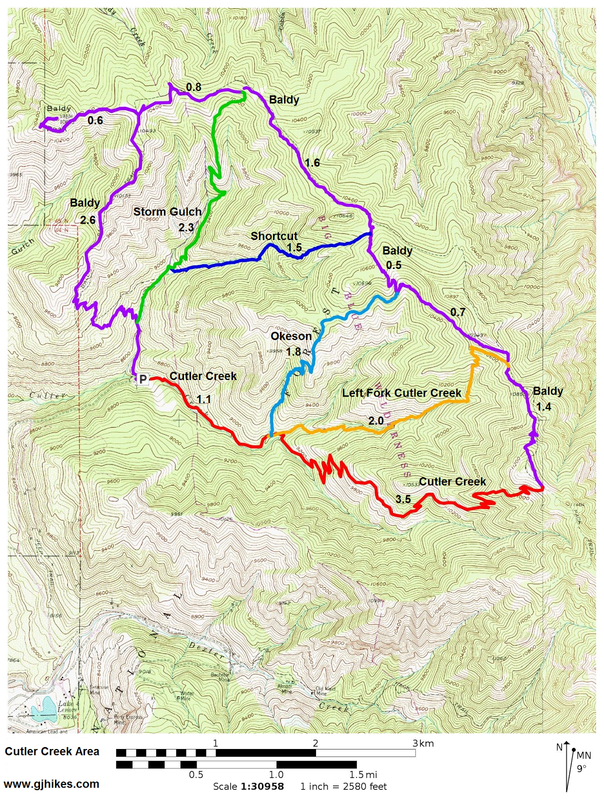 After a short distance it passes into the Uncompahgre Wilderness Area and after a little more than one mile it reaches the point where the Okeson trail branches off on the left. As the Okeson trail begins it passes through a grassy area where it tends to get overgrown and obscured. Aim for the hill on the left and the obvious trail will be more evident. Looking up the valley it doesn't appear to be all that far to Baldy Ridge. The trail isn't a straight course though as it has numerous switchbacks and actually doesn't get up to the ridge until it reaches a point much further to the east. The Okeson trail by itself is only about 1.8 miles so it isn't all that far anyway. The Okeson trail climbs along the west side of the creek for about half a mile. Near the 1.5 mile point from the Cutler Creek trailhead or the half mile point from where the Okeson trail began the trail crosses a stream and shortly comes to a fork. 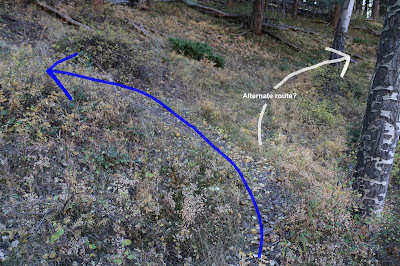 We believe that the less traveled trail on the right goes around the hillside and meets back up with the main route higher up on a hogback ridgeline. We have never taken that route so we can't say anything else about it. From the fork the main route picks a moderate angle up the steeply sloping mountainside. The trail continually switches directions to keep the trail ascending at the same moderate angle. Eventually the trail gets high enough and the trees thin out to the point that you can see over the surrounding ridges where magnificent alpine scenery comes into view. Just over the 2 mile point from the Cutler Creek trailhead the Okeson trail reaches a grassy hogback ridge that it makes a beeline up. This is a look back down the ridge towards Cutler Creek. To us the climb seemed a lot easier than the picture might make it appear but we had climbed Mount Massive the day before so our judgement is influenced in part by that. At the top of the hogback the trail travels through the trees for a short distance and then turns more toward the east where it traverses around a high point along Baldy Ridge. For the next little while the trail skirts the treeline as it works its way around to an easier spot along the Baldy trail. This last portion of the Okeson trail is easy hiking as it alternates between traveling out in the open and passing through thin sections of forest. The trail comes to an end at a marked intersection with the Baldy trail. From here you can go to the right along the Baldy trail toward the Left Fork Cutler Creek and Cutler Creek trails or go straight and take the Baldy trail west toward the Shortcut and Storm Gulch trails. Or you could continue past both of those and climb Mount Baldy. The map will help you work out a route to your liking. The slideshow depicts the route that we took to the west where we made a loop down the Shortcut trail. The Okeson trail is a good route for getting to and from the mid point of Baldy Ridge. It doesn't seem quite as steep as the Cutoff and Left Fork Cutler trails. If you would like to see it for yourself then all you have to do is 'Take a hike'.